Is that ocean I see?? And YOU see! congratulations!! The red line has almost Kissed the Sea. That’s poetic, or romantic. Take your pick. if this is from bay city, then this is tillamook bay, NOT the pacific ocean. and this was two hours ago, so 1130am/pdt. oh! and i just realized that the rockaway beach folks expect him between 3 and 4 PDT! that’s 6-7 EST. der!! Yet another incredible view. Thanks fora taking us along! Ooh, so gorgeous! Makes me want to climb over the embankment…. The ocean! Thanks, Matt, for the great trip you have shared with all of us! I am supposed to be making meatballs, but cannot tear myself away from the computer! the suspense iskilling me. This is such a beautiful photo! Me, too, Christine! I’m supposed to be working, but I can’t wait till the finale! Loved this journey we all had with Matt! meatballs and work….You two are a chef! Matt – one foot in front of the other. No turning back now. you the walker. Me, too! Stupid work is trying to tear me away, but I will not be deterred! Attaboy Matt! What a gorgeous view. I’m glad you have a nice sunny day for the finale. I’m with Christine…I’m so hooked on seeing the final pics!! arg! I’ve enjoyed adventuring vicariously through you since I first heard about your journey. It must be exciting to be so close to your destination! Thanks for sharing your trip! Won’t be long now! This has been a marvelous trip – thank you, Matt, for letting us all come along with you! 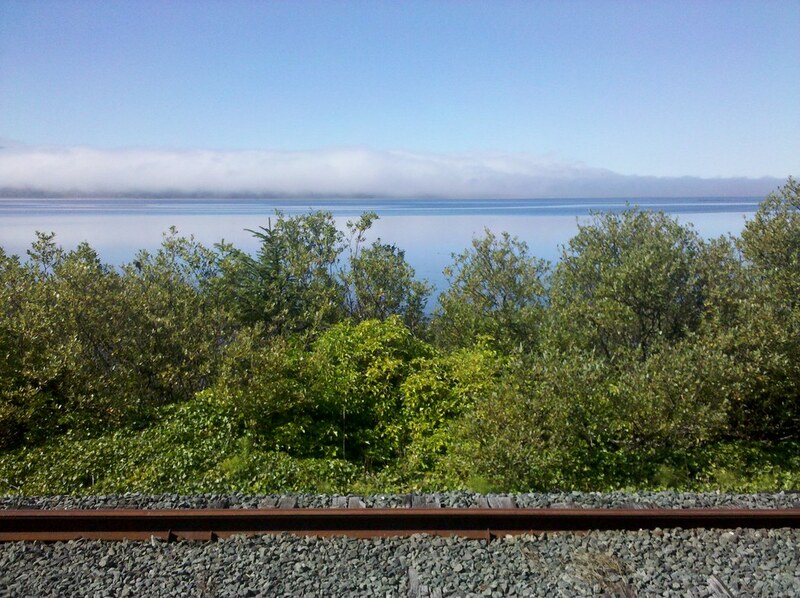 Glad the fog bank is holding off……oh (sigh) Oregon is just so beautiful! Plains, snow capped mountains, rivers, waterfalls, forests, Willamette Valley and the coast. Thanks for the beautiful picture Matt! Thanks for sharing. How you feeling? Not much further…..
Wow – Mapquest says 1.8 miles from Tillamook Bay to Rockaway Beach! 1:18 in Portland. He said he would be there around 2:00. I believe he will do it! I guess that exactness is the engineer in him. I wish I could see the pictures. 2 miles less then half hour. The smell of the Pacific Ocean must be quite enticing by now! I’m so keyed up I could run a mile! I’m not a runner so that is a long way for me! Who’s got their eye on YouTube for arrival videos?? Post links if you can. Yehawwww! Wow! When Matt says he’s getting close, that makes it so much more real (if that makes sense). I can feel the tears coming – happy, sad, happy, sad. Anybody got a box of Kleenex?? Here Julie, I have a ‘virtual box’ here on my desk at work. So do you start walking faster now? The suspense is killing me too! – I’m cheating by being here on this last photo – I can’t catch up on all the photos posted since yesterday – Matt you are on my mind and in my heart! Excited for you! Grinning for no reason (at least no reason from work)! Candice I was on Facebook, was that you on Matt’s Facebook page. on he wiil cross the Goal Line today. Yes – that was me on one of the Matt Green Facebook pages. Can you imagine how excited MATT is! His grin can’t be any bigger than mine! Do you reckon CNN will be there, they may have LARRY KING OR JOHN KING there to interview him. I’ll miss you, Matt! Even though I’ve never seen or spoken to the guy…oh well. I wonder what’s going on in that head of his knowing he’s about done with this adventure. What a long, strange trip it’s been. Like so many of you, I’ve been glued to imjustwalkin today not wanting to miss Matt’s final steps as he enters Rockaway Beach, OR. (Work is getting done in between pictures – priorities!) This has been a wonderful journey for me as well; I find myself wanting to walk more, to get out and enjoy God’s beautiful creation of all kinds: people, landscape, creatures of the land and air. And for this I’m grateful that Matt has invited us to “walk” along with him across America. For the past five months, home has been wherever Matt parked his Runabout, affectionately known as the Mattmobile, each evening. His home has been in the middle of nowhere, it’s been on someone’s front lawn, it’s been in someone’s home or RV, but most of all it’s been across this great country we call America. Matt, you have been an absolute blessing to those who have personally met you and to those who only know you through your blog. We have all become blessings to each other. Your sign “We may never meet again” might be true, but as you travel home, you take with you our thoughts & prayers, and on behalf of the HoboPlanet, we wish you peace & love, wherever that may be. This song is for you. Thank you. Nicely put, Barb. Thank you for sharing that. Now that is a song I know well. And the chills are running up and down my spine. Don’t need a tissue (yet) but I sing this with my girls all the time. Barb V it has been a pleasure for all of us. Barb, that was wonderful. Very well said. Dang it. No youtube at work…it will have to wait until tonight. OH yeah, and everything Barb said. It’s just been wonderful!!! Goodnight Matt…goodnight Don….goodnight Barb…goodnight grandpa! Love the colors. You’re so near Matt, I’m so happy and excited for you. Rock on! Matt, been following since I saw it on one of those morning shows it seems a long time ago. Stoked for you. Thanks for taking us on the journey. Amazing. Western water! Awesome! You’re almost there. Like many here, I am sitting at my desk grinning stupidly, and wishing you all the best as you take those last few steps. Way to go! Work? What work? I’ve been “hobo-ing” all day. Work is something I’m doing in between reading and posting. Oh yeah, me too. And my darn phone keeps ringing! Don’t they know??? Mat slow down take 2 more days then I win ! 5 months 3 days….Matt your almost there!!!!!!! I’m not sure what i’m going to look forward too now!!! LOL who is making the fan club???? I’ve started a blog for us all to go to. Not sure how it will work, but figured it was a good place to start. :) Feel free to chime in anytime. Gorgeous, Matt. Just splendiferous. I have a 630pm conference call (who knew? ), so if there is an arrival pic during that time, please keep the yelling down to a dull roar, HobNats! NAH. Let it all hang out. It’s party time! WOOT WOOT! Yes – Lori – I had a 500 error just a few minutes ago – but I finally got the page up! Oh if only Google Earth were a LIVE satelite feed!!! Lori, not sure what site you mean, but you’re here. @Lori – me too, but I’m sure the site is taking just a tad too many F5’s that it can handle. I was thinking the site would crash today with everyone logged on and updating every few minutes. Luckily it was built well enough to handle all of hobo-nation! It’s bound to crash!!! But we’ll still celebrate!!! For any one who would like to know…Matt looks to be just North of Bay City to get this angle…..I may be a little off but judging from the railroad tracks and the little bit of land w/ no houses obstructing…He is about (roughly) 9 miles from Rockaway Beach which means he will be there by this evening!!!!! OMG! and the issues with connecting is probably bandwidth…weve all been waiting so long knowing today is the day and all checking back frequently! Any time between now and the next hour! Dang! I have to sign off now – must go to a fund-raiser dinner tonight with the hubby. Catch up with y’all right after! In case Matt gets to RB before I get back online – YAAAAAAAAAAY, MATT! Whoo-hoo! So proud of you, and so happy that I got to “walk” along with you!” I’ll have wine when I get home! Ok, I’m heading home and praying for no rush-hour traffic. Be back soon!!! Be careful – don’t rush! 275 was clear tonight. 71 a bit dicy by Pfieffer… get home safe Julie…. Hobo Nation rejoices tonight. Got the bubbly in the fridge waiting to be popped. It’s 4:04PM here in Chicago…the Tequila is out to celebrate Matt’s final steps!!! HI!! You met my mom today!! I really enjoyed talking to you on the phone!! 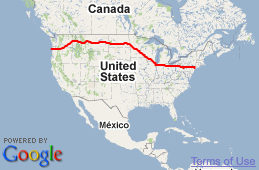 Congratulations…and remember that maybe we could get a Hobo Nation walkathon from Chicago to California–Route 66!! This is so exciting and probably ending right now as I write this. It has been a long and fun journey, and I too will miss his wonderful pictures and wit. I joined up around day 62 in Wisconsin. I used to live in that area so it was doubly exciting for me. Now this tops it all! Congratulations again Matt! And a fond bittersweet end to the journey for all of the Hobo Planet. I will keep checking for more pics. I need to go start dinner (5:06 PM EST), but I don’t want to miss the finish in somewhat “real” time. Just after 2pm west coast time…Matt must be arriving. What I would give to be watching or, even better, tagging along for that last mile or so. Like all of you, the end of the journey is all I think about today. Thank you for this, Matt. It’s been wonderful. Can’t you just see that beautiful winning smile on Matt’s face. I picture him almost glowing with pride as he walks those last few feet! Way to go!!!!!!!!! I’m fading..please someone, pour me some coffee! Hang in there Karin……..almost there! You can make it! Just a little longer. Order up….No coke Pepsi Clamato shots for everyone!!! He must be there right now, basking in the warm day and the welcoming Rockawayers. I can only imagine…. I very much wonder if Matt will return to his life in NYC and if that life after this adventure will be enough to sustain him….Of course he will love his friends and family and that will never change, but will the city feel confining after this adventure? Will the noises of cars and sirens be too much…I lived in LA as a kid..There is no way I could go back after tasting the open highways and massive plains and the cool fog during sunrise in the forests….I wish Matt all the best of luck and hope the transition back to the city won’t be too hard on him. Congratulations, man. You’re an inspiration. It’s dated yesterday, too bad. Oh to see all the fun at the red caboose! Where is the red caboose on the route map? I find S. 1st street (zooming in), but can’t tell where the red caboose/chamber of commerce is located. According to RBCC’s comment a few pictures back, they will meet Matt in the Wayside which is near their office. Does anyone have any idea what the Wayside is? They also warned Matt it’s too cold to take a dip in the Pacific but our hobo wants to end the journey with that. Nearly there, I’m smiling now and raising my fist in the air. Hooray for Matt! did matt know there was a red caboose at the “end” of his long trip?? Makes you wonder. You are about there. What’s a couple of yards? I have never seen this website unitl today. Matt talks extensively about his trip. The best one I have seen since he left NY. It’s a long one, so it takes quite a while to read it. the author of the article walked with matt for 11 miles. Yep, one of the better articles. I might read it again. FAR OUT!!!! young man. congratulations. are ya gonna walk home now??? lol!can’t wait to see the end of this day with you!!! An earlier poster thought that this should be on CNN. Absolutely. I can’t even watch the news channels anymore because of the continual rehashing of depressing stuff. Give us more stories about the triumph of the human spirit. This journey has clearly inspired many people. The reminder that this country is full of kind, generous, hospitable people is also a good thing. http://www.rockawaybeach.net/index.php?option=com_content&view=article&id=49&Itemid=57 Caboose shown (not live). hard do I hear the theme to 2001 playing in the background……Tranquility Base…..the eagle has almost landed… One small walk for Matt one giant Leap for the world! That is perfect! The theme is Richard Strauss’s “Also Sprach Zarathustra” – EPIC music for an EPIC journey. Is that not dunnnnnn…..dunnnnnnnn…..dunnnnnnnnnnnnnnnnn…..DUNDUNNNNNNNNNNNNNNNNNNNNNNNN boom boom boom boom boom boom boom boom boom boom (repeat)? Hay Candice: wanted to say Hi…and a pleasure being your back up for the self portrait from the traffic cam. You rock. I will think of you always as I watch Phineaus and Ferb. that is the soundtrack. so are we there yet??? It is almost 6 p.m. EDT, and this is the first chance today, of all days, that I’ve had to come here. He has now, of course, reached the end of the road. It will likely be a few days, or so, before he has time to come back here to post again. To all of the people on here posting with the rest of us, thanks for the fun. I have enjoyed coming here almost every day to be a part of all of this. It’s been a hoot. There were a few more updates that seem to have disappeared. Is that picture of Matt on the Rockaway Beach, OR .net site him as he arrived? or just a teaser? Ooh, I just saw two digitally garbled photos on flickr, that were since deleted! He’s there! Oysters! Looked like problem uploads. They’ll probably be there in a minute or so. YEAH! OYSTERS!!! MOUNTAINS OF OYSTERS! and ‘MORE TILLAMOOK BAY’. c’mon! quit teasin’ us, matt! ok, and now, that ‘exploding house’ and the pennies on the rail track!. what’s going on here? the last picture was taken TWENTY MINUTES AGO IN TWIN ROCKS OREGON! HE IS ONE MILE AWAY! wait, no, 22 minutes ago, 1 mile away. HE MUST BE THERE ALREADY!! I came across your trek when it hit Yahoo News around day 60. Since then, checking your progress has become a part of my daily routine. Thank you for the pictures and stories; they never fail to inspire, and have, at times, mad a bad day better. I can only imagine the profound change your journey has had on you. Good luck, and please consider another trip back across the country, especially since I don’t know what I’m going to do for desktop wallpaper now. I have so enjoyed your journey, watching the places you have visited. I am sad to see your journey end, and have enjoyed the community your journey has fostered. I have followed you pretty much from Day 1…. So long my friend, and may you continue to do amazing things! !